The power supply in the NorthStar Horizon is a linear supply (common for the day), consisting of a transformer, rectifier, and capacitor. The electrolytic capacitors in a linear supply are large, and the electrolyte inside the capacitor has a tendency to dry out as the capacitor ages. It is important to test and condition old electrolytic capacitors before putting them back in to service, otherwise a catastrophic failure may occur, which could take out other components. In order to wake the capacitors from their sleep, and to test their effectiveness, I like to place a voltage across them (with a current-limiting resistor), and bring up the voltage over time to their maximum working voltage. This process can help re-form the aluminum oxide layer in the capacitor. At each step, the current should drop as the capacitor charges up. 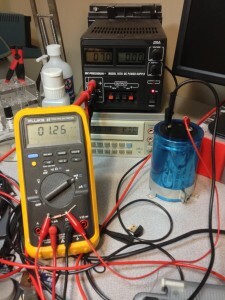 Once the capacitor is charged, the current should be minimal. If there is more than a couple of mA flowing, the capacitor should be replaced. In my case, the two smaller capacitors pass with flying colours. The large capacitor is still leaking 0.96mA after 2 hours of conditioning at 15v. Oh, and remember to discharge the capacitor after reconditioning it. There’s a lot of joules stored in there!